Here is the martian twilight sky at Gusev crater, as imaged by the panoramic camera on NASA's Mars Exploration Rover Spirit around 6:20 in the evening of the rover's 464th martian day, or sol (April 23, 2005). Spirit was commanded to stay awake briefly after sending that sol's data to Mars Odyssey at sunset. This small panorama of the western sky was obtained using camera's 750-nanometer, 530-nanometer and 430-nanometer color filters. This filter combination allows false color images to be generated that are similar to what a human would see, but with the colors exaggerated. 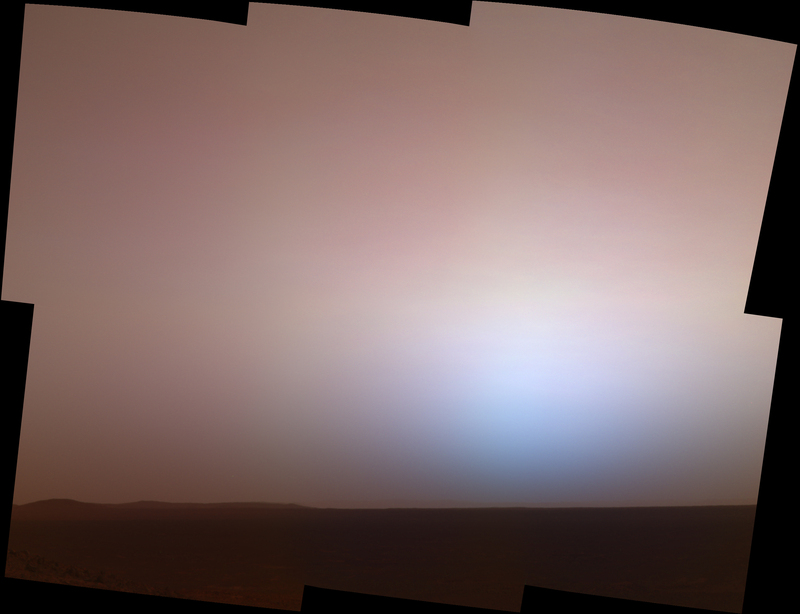 In this image, the bluish glow in the sky above where the Sun had just set would be visible to us if we were there, but the redness of the sky farther from the sunset is exaggerated compared to the daytime colors of the martian sky. These kinds of images are beautiful and evocative, but they also have important scientific purposes. 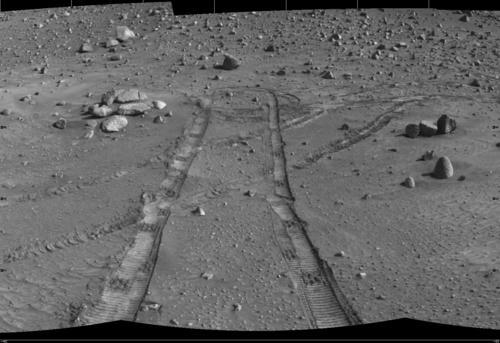 Specifically, twilight images are occasionally acquired by the science team to determine how high into the atmosphere the martian dust extends, and to look for dust or ice clouds. Other images have shown that the twilight glow remains visible, but increasingly fainter, for up to two hours before sunrise or after sunset. The long martian twilight compared to Earth's is caused by sunlight scattered around to the night side of the planet by abundant high altitude dust. Similar long twilights or extra-colorful sunrises and sunsets sometimes occur on Earth when tiny dust grains that are erupted from powerful volcanoes scatter light high in the atmosphere. These kinds of twilight images are also more sensitive to faint cloud structures, though none were detected when these images were acquired. Clouds have been rare at Gusev crater during Spirit's 16-month mission so far.